In 1912 Gin Mon Louie was applying to visit China. His witness, Willard A. Norse, testified that he was 50 years old and living at 1902 Yesler Way and was in the hotel business. He owned two hotels– at 114-1/2 2nd South and 122 2nd South in Seattle. For the past five years M. Hee Woo (He Wo), a Chinese doctor, rented five rooms at the hotel on 122 2nd South. Dr. Woo was Gin Mon Louie’s employer and when Woo visited China in early 1912, Gin Mon Louie took over the business for him until his return. Then it was Gin Mon Louie’s turn to visit China. F. T. Carlton, a druggist, age 52, living a 1942 10th Avenue West in Seattle, also testified for Gin Mon Louie in 1912. They were both druggists in the same building and saw each other four or five times a day. Carlton knew that Gin Mon Louie was going to China to get married. Gin Mon Louie application was approved. He visited China, married, returned in September 1913 and received his Certificate of Identity #12747. When Gin Mon Louie applied to visit China in 1921 his witnesses were Dr. J. E. Godfrey and Axel Hedberg. Godfrey was a physician and surgeon residing at 103 Second Avenue South. He had lived in Seattle since 1914. He knew about a couple dozen Chinese and named Dr. Louie, Quon Foy, Chin Him and Tom Leong as examples. He stated that Gin Mon Louie was a Chinese herb doctor, not a regular licensed physician, but a sanipractor [drugless-healer/naturopathic doctor]. Dr. Lamb was his partner. Godfrey and Gin Mon Louie were friends and saw each other about once a month. Gin Mon Louie’s other witness, Alex Hedberg, was the newspaper publisher for the Swedish Tribune and lived at 44 Rose Avenue in Sunnyside. Hedberg did not know many Chinese but was acquainted with Gin Mon Louie because Louie advertised in his newspaper. He went to Gin Mon Louie’s office monthly to collect the five dollars owed him for the ads. 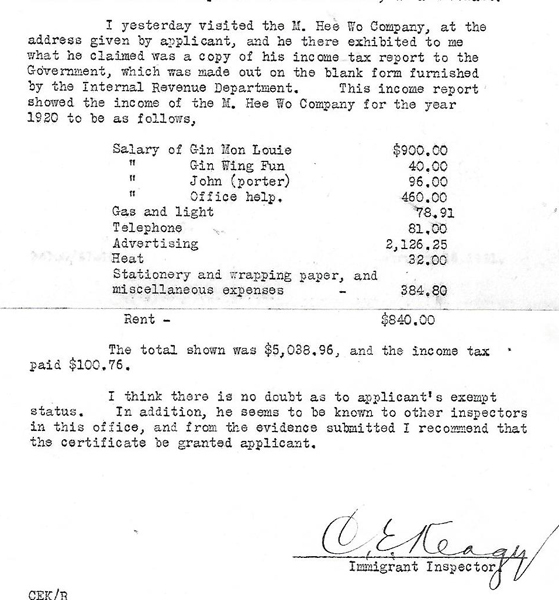 Charles E. Keagy, Immigrant Inspector, visited Dr. Louie at his office and obtained a copy of M. Hee Wo (Hee Woo) Company’s income tax report for 1920. He recommended that Gin Mon Louie’s application to visit China and return as a merchant be approved. “Seattle Correspondence: Inspector to Commissioner, 35100/27-10,” 1921, Chinese Exclusion Act case files, RG 85, National Archives-Seattle, Gin Mon Louie case file, Seattle Box 1003, 7032/3549. In 1924 Gin Mon Louie made another trip to China. Godfrey and Hedberg were his witnesses again. Gin Mon Louie visited China again in 1934 and returned in 1937. The interrogators asked him about his interactions in China with Chinese who were residents of the United States: Did he visit with anyone in his village that was from the U.S? Did he attend a wedding of anyone from the U.S.? Did he arrange to appear as a witness for a prospective applicant for admission to the U.S.? Louie answered no to all these questions and there were not follow-up questions. The Examining Inspector, Roy C. Matterson, reviewed information from when Gin Mon Louie originally came into the United States. 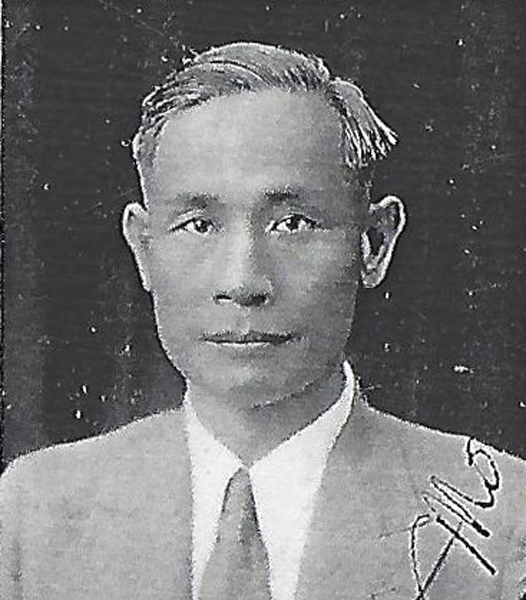 He was first admitted at San Francisco as a student in 1904 and was sometimes known as Jin Mon Yuey. Immigration listed him as Chan Man Yai but Gin Mon Louie thought it was either misspelled or mispronounced. Matterson updated Gin Mon Louie’s family information. His marriage name was Jin Lip Moon. He was married to Yee Shee and they had two sons, Jin Ok Jung and Jin Hing Lok; all living in China. 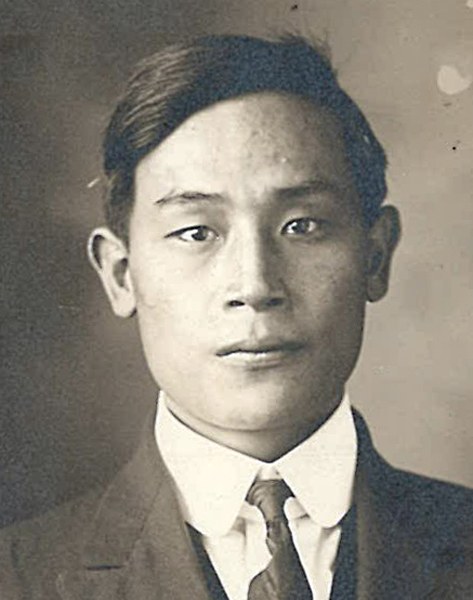 “Photos of Gin Mon Louie,” 1913, 1937, Chinese Exclusion Act case files, RG 85, National Archives-Seattle, Gin Mon Louie case file, Seattle Box 1003, 7032/3549. Gin Mon Louie was admitted.